The Floating Security Line is a security line for water rescue, rafting, boating or towing. The rope is made of a 16-plait XLF (extremely light fiber) hollow weave. This construction and material make the line buoyant and easy to splice. Its high visibility colors make it easy to see. Floating Security Line is the perfect blend of price and safety for all water rescue and security applications where rope certification is not a requirement. It is made of a 16 strand extremely light fiber (XLF) hollow weave braid and its 100% polypropylene construction makes the line buoyant and very easy to splice. 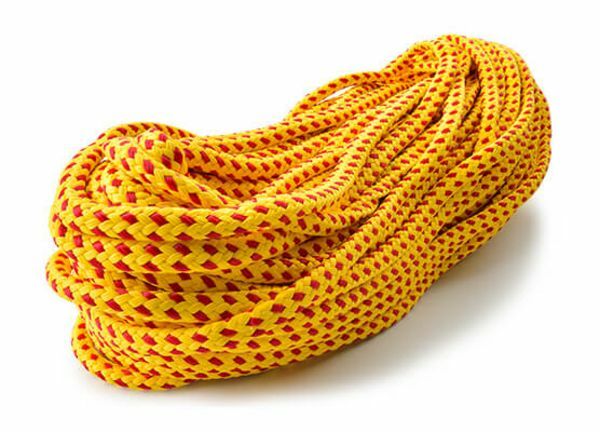 The red and yellow signal colors give this safety and rescue rope high visibility. Floating Security Line comes in 8mm and 10mm diameters and a host of lengths to fit any of your rescue or safety needs. Floating Security Line is ideal for rafting, boating, river crossing guidelines, swimming area buoys, towing or any other applications where floating rope that does not need to be certified may be used. Made in the USA! Floating Security Line is proudly made by expert crafts men and women in our US facility located in Fall River, Massachusetts.